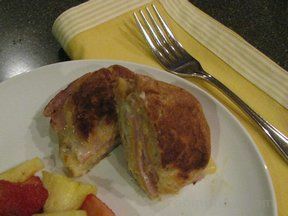 Sweet and savory with the combination of the cinnamon and the ham. Kids and adults will love it. Perfect to serve when you have guests as they can be made fresh as people wake up. 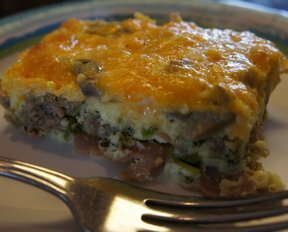 In a large bowl, beat together eggs and milk; stir in cinnamon and nutmeg. 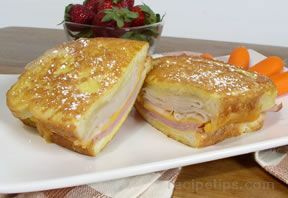 To assemble the sandwiches, layer four croissant halves with a slice of cheese, ham, another slice of cheese, turkey and another slice of cheese. Cover with tops. Over medium heat, place a large skillet. 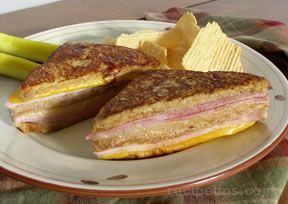 Dip the assembled sandwiches in the egg mixture, place in the skillet and cook until lightly brown on both sides and cheese has melted.